“In some cases, vegetarian women may have nutrient intakes that lower their risk for chronic disease,” says Messina, who also provides nutrition resources on her website, VeganforHer.com. “In terms of heart health, vegan diets are free of cholesterol. Depending on food choices, vegan and vegetarian diets can be low in saturated fats,” adds Reed Mangels, PhD, RD, LDN, a plant-based nutrition expert, author, and nutrition advisor for The Vegetarian Resource Group. One of the main advantages of a well-planned plant-based diet is its rich nutrient profile, which may be even more important for older women. “Vegetarians eat more fiber and less saturated fat and have diets that are richer in antioxidants, so there are some definite advantages to eating this way as we age,” Messina says. Since energy needs decline as women age, they often struggle with weight gain.6 It’s well documented that plant-based diets—in particular vegan diets—are associated with lower BMI. A new study analyzing data from the AHS-2 found that mean BMI was lowest in vegans (23.6) and incrementally higher in lacto-ovo vegetarians (25.7), pesco-vegetarians (26.3), semivegetarians (27.3), and nonvegetarians (28.8).7 Thus, a plant-based diet may help women meet their nutritional needs while avoiding weight gain and its cascade of health problems, which may occur as a result of higher body fat. “The AHS-2 found that those with higher protein intake had better bone density, no matter where the protein came from,” Haddad adds. Messina suggests that it’s important to choose protein-dense foods, particularly those that are high in the amino acid lysine. “These are legumes, such as beans, soyfoods, and peanuts. Most older women will need at least four servings of these foods each day. It’s not hard to consume that amount, since a serving is just 1/2 cup of beans, tofu, or soymilk or 2 T of peanut butter. But it does mean that some women may need to emphasize legumes over grains,” she adds. Another important concern among older women—vegetarians and nonvegetarians alike—is bone mass preservation. Osteoporosis affects an estimated 200 million women worldwide—approximately one-tenth of women aged 60, one-fifth of women aged 70, and two-fifths of women aged 80, according to the International Osteoporosis Foundation.8 Some dietary factors, such as calcium and vitamin D intake, which typically are associated with dairy foods, are important for bone health and may be challenging to get in vegan diets. However, plant-based diets can be rich in other key nutrients involved in bone health, such as vitamin K and magnesium. Are vegetarians—especially vegans, who avoid dairy products altogether—at a greater risk of osteoporosis? “Older vegan women need to put some emphasis on calcium-rich foods, since calcium needs increase with age,” Messina says. “And women are at higher risk of bone loss.” According to Mangels, some studies point out the risk of lower bone mineral density among vegetarians and vegan women, but the evidence is complicated. When it comes to bone health, it may be more effective to look at a person’s individual nutrient intake rather than generalizing a dietary pattern. For example, a poorly planned vegan diet can be inadequate as far as protein, calcium, and vitamin D and put an older woman at risk of osteoporosis, just as a nonvegetarian diet can. To support bone health, Mangels recommends “adequate protein—at least meeting the RDA of 0.8 g/kg/day and possibly going somewhat higher, since higher protein intakes along with exercise have slowed the loss of muscle mass that occurs with aging. An intake of 1 to 1.2 g/kg/day of protein seems reasonable.” As for calcium, she recommends meeting the current RDA of 1,200 mg/day of calcium for women aged 51 and older. To achieve adequate levels of calcium and vitamin D, vegetarian women can follow the USDA MyPlate recommendations, which call for three servings of low-fat or fat-free milk, yogurt, and other dairy products as well as calcium-fortified foods and beverages. Vegan women can replace these dairy servings with other calcium-rich foods and beverages.9 “For vegans, calcium-rich foods are fortified plant milks, fortified juices, tofu made with calcium sulfate, and leafy greens such as collards, turnip greens, kale, and bok choy,” Messina says. Vitamin D is found in fortified plant milks, and vegan women are encouraged to get 10 to 15 minutes of sunlight exposure per day. “The AHS-2 showed that vitamin D status was best for people that lived in areas with more sunshine; it was not as dependent on diet,” says Haddad, who stresses that getting adequate vitamin D is important. Mangels suggests meeting the current RDA for vitamin D, which is 600 IU/day for women aged 51 to 70 and 800 IU/day for women older than 70. While several studies have found that EPA and DHA levels are lower in vegetarians and vegans than in nonvegetarians, Haddad reports that the AHS-2 revealed more positive findings. “Omega-3 levels—EPA, DHA, and ALA—in the body were good among vegetarians and vegans in AHS-2,” she says, adding that she believes health care professionals should encourage adequate intakes of ALA, EPA, and DHA in this population, although she warns against “going overboard” with them. While getting enough ALA may be easy, as it’s found in many foods that appear on the typical plant-based menu, EPA and DHA may be more elusive for vegetarians and vegans. However, the rising availability of marine algae supplements containing EPA and DHA has made it easier to get these healthful fats. “The need for supplements of DHA and EPA continues to be controversial. But conversion of ALA to these long-chain omega-3 fats may be less efficient in older people, so it may be a good idea to take a small daily supplement providing 200 to 300 mg of DHA and EPA combined,” Messina suggests. Just as important as meeting the required intake of omega-3s through diet is maintaining adequate levels of vitamin B12. It plays a major role in metabolism, red blood cell formation, central nervous system maintenance, and DNA creation. Vitamin B12 deficiency is serious, as it may result in megaloblastic anemia, with symptoms that include numbness in the arms, difficulty walking, memory loss, and disorientation. “Many older adults have difficulty with absorbing vitamin B12 from meat and dairy products but are able to absorb vitamin B12 from fortified foods and/or supplements,” Mangels says. When you look at the evidence on plant-based diets for older women, one idea seems clear: Vegetarian and vegan diets can provide health benefits or potential risks, but this depends on how appropriate and well planned the diet is. As with any diet pattern, it’s possible to skip key nutrients such as calcium and vitamin D that are essential for health or overload on unhealthful nutrients such as refined carbohydrates and sodium, which may be detrimental to health. However, a balanced plant-based diet—rich in legumes, whole grains, vegetables, fruits, nuts, seeds, and healthful fats—offers all of the foods that are linked to optimal health. Thus, working with patients individually to ensure that they meet their nutrient needs while on a plant-based diet is the key to success. Messina suggests that dietitians help older women balance their calorie needs, which decrease after menopause, while still meeting their nutrient needs. “It really is important for postmenopausal women to eat a very nutrient-dense diet by including plenty of vegetables in meals and limiting ‘discretionary’ calories from sweets, snack foods, and alcohol. It doesn’t mean you can never have these foods, but putting the emphasis on whole plant foods becomes increasingly important. And including plenty of exercise in your routine will allow you to consume more calories, which in turn helps with meeting nutrient needs,” she says. Mangels agrees, suggesting that RDs should encourage older female clients to choose a variety of plant foods each day, including beans, grains, fruits, vegetables, and nuts, and to limit empty calories such as soda, sweets, and salty snack foods. “The Dietary Guidelines for Americans call for a reduction in dietary sodium to 1,500 mg/day after age 50. This is a sensible step to reduce the risk of developing hypertension. Diets with limited amounts of processed foods and no or little added salt typically meet these guidelines,” she says. Another issue may be overrestriction, according to Haddad. “I believe that vegetarian and vegan diets can be health protective for older women. You just have to get enough calories; you can’t be the kind of vegan that doesn’t eat this and that. You won’t get enough calories. I suggest cooking with olive oil and including sufficient fat to get enough calories, which makes protein more available to the body,” she explains. Mangels also recommends that older women eat “at least three meals a day; it’s a challenge to meet nutrient needs in only one or two meals. Eat protein-rich foods several times a day, such as beans and soy products, and dairy products and eggs if they’re not vegan.” In addition, she says to include a reliable source or sources of vitamin B12 every day, such as fortified foods including plant milks, breakfast cereal, nutritional yeast, and meat analogues, or a supplement. And fortified plant milks can help to meet needs for calcium and vitamin D.
— Sharon Palmer, RD, is a contributing editor at Today’s Dietitian and the author of The Plant-Powered Diet and the forthcoming Plant-Powered for Life. 1. Stahler C. How often do Americans eat vegetarian meals? And how many adults in the U.S. are vegetarian? The Vegetarian Resource Group website. http://www.vrg.org/blog/2012/05/18/how-often-do-americans-eat-vegetarian-meals-and-how-many-adults-in-the-u-s-are-vegetarian/. Accessed January 15, 2014. 3. Adventist Health Study-2: early findings. Loma Linda University School of Public Health website. http://www.llu.edu/public-health/health/early_findings.page. Accessed January 10, 2014. 4. Orlich MJ, Singh PN, Sabate J, et al. Vegetarian dietary patterns and mortality in Adventist Health Study 2. JAMA Intern Med. 2013;173(13):1230-1238. 5. Crowe FL, Appleby PN, Travis RC, Key TJ. Risk of hospitalization or death from ischemic heart disease among British vegetarians and nonvegetarians: results from the EPIC-Oxford cohort study. Am J Clin Nutr. 2013;97(3):597-603. 6. Bernstein M, Munoz N; Academy of Nutrition and Dietetics. Position of the Academy of Nutrition and Dietetics: food and nutrition for older adults: promoting health and wellness. J Acad Nutr Diet. 2012;112(8):1255-1277. 7. Tonstad S, Butler T, Yan R, Fraser GE. Type of vegetarian diet, body weight, and prevalence of type 2 diabetes. Diabetes Care. 2009;32(5):791-796. 8. Facts and statistics. International Osteoporosis Foundation website. http://www.iofbonehealth.org/facts-statistics. Accessed January 25, 2014. 9. What foods are included in the dairy group? ChooseMyPlate.gov website. http://www.choosemyplate.gov/food-groups/dairy.html. Accessed January 26, 2014. 10. Omega-3 fatty acids: an essential contribution. Harvard School of Public Health website. 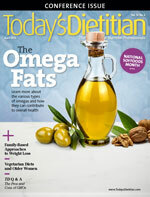 http://www.hsph.harvard.edu/nutritionsource/omega-3-fats/. Accessed January 26, 2014. 11. Institute of Medicine Food and Nutrition Board. Dietary Reference Intakes: Thiamin, Riboflavin, Niacin, Vitamin B6, Folate, Vitamin B12, Pantothenic Acid, Biotin, and Choline. Washington, DC: National Academy Press; 1998.